The basic idea behind this self esteem worksheet is to become more aware of what you think and feel by taking a few moments every day to focus your attention inwards. For some people this might seem easy, but as I've found in my work, many people find it difficult to accurately identify and name their feelings. This is a skill that can be developed with practice. Knowing yourself and being in touch with how you feel at any given moment is a contributor to positive self esteem, as it gives you the information you need to make good choices for yourself. As you probably know, if you've read this page, self esteem is all about making self-helpful choices. Many people also struggle to just stop for a moment. If you are one of those people who's mind races all the time, even when you are trying to go to sleep at night, try this self esteem worksheet to develop your ability to come to rest. When you are able to rest for a moment, and get really familiar with how it feels - you will be able to call on this ability whenever your mind gets on that treadmill. Another benefit of using this self esteem worksheet to practice identifying your emotions, is that the more skilled you become at perceiving your own emotions, the more you are able to recognize emotions in other people. This is a basic emotional intelligence skill and is crucial for good communication and relationships. But lets get back to the self esteem activity! •	A handful of colours. This could be coloured pencils, pens, crayons, felt tips or oil pastels (whatever you like as long as you have a few colours to work with.) Paint is great too, but takes longer to set up and clean up, and you really want to be able to do this quickly, every day, with a minimum of fuss. 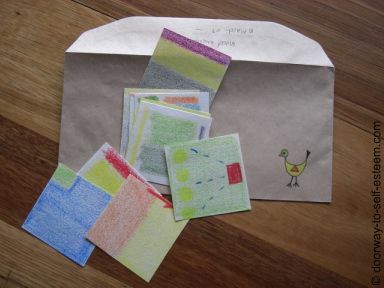 •	A medium sized envelope or small cardboard box or some wall space that you can use to tape up your cards (do this on a poster if you don't want to stick things on the walls). •	3 minutes every day for a few weeks. 1. Every day, at a convenient time, take a small piece of paper or card. I like mornings or evenings best. 2. Grab the colours that appeal to you and colour the card any which way you want. If its one colour, great. If its pink polka dots with yellow stripes - hey, whatever colours you want are the right ones to use. 3. Do not write words or numbers while colouring. And try to steer clear of 'meaningful' pictures. So, for example, don't draw a little tree or house. In fact, if you can manage it for a couple of minutes, try not to think while you do this activity! Symbols like circles, squares, triangles or other shapes are ok, as long as you are not thinking about them too much when you draw them! Just colour and scribble and play for a minute. The card can be as full or empty as you like. It can even consist of one dot, or a line. Be spontaneous! No-one will see these cards, but you (if that's the way you want it) and there is no 'right' or 'wrong' way of doing them. 4. Now sit still for a few seconds and try to get an idea of what kind of mood you're in. When you've got a good sense of it, choose a word or a couple of words to describe it. Write this at the back of the card. You can also number or date your card. It only takes a couple of minutes to do the whole thing. 5. Keep your cards together in an envelope or box, or tape them on the wall / poster day by day so you can see them as you go through the month. Don't worry if you skip a day or two, you are exploring, not working! If you really want this exercise to count, though, try to do it consistently for about 6 weeks. The habit you are learning is how to pay attention to your inner self. You need to give it enough time to 'stick'. Route vs Destination: Enjoy the Route! The end result (the actual coloured cards) is not the main aim of this self esteem worksheet. The valuable part is learning to be aware of what you are feeling in the present moment. Keeping still for a few moments every day and thinking about how you feel focuses your attention. If this brings just a little bit more awareness to your emotions and moods, then this self esteem worksheet has been successful. The end result can be pretty too! Paste them onto a poster, writing your 'mood' word under each one. Tape them up on the wall day by day (on a large poster if you can't put tape on the walls) until you have a long string of colours representing your daily moods. Make a colour photocopy of your poster, shrinking it down to the size of an A4 book - use it as a book-cover, or keep it as a monthly 'mood journal'. Make a mini version of the mood mural. 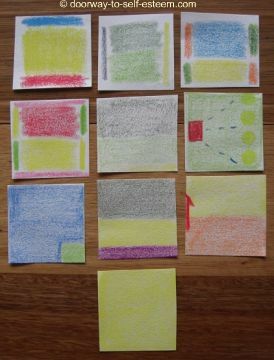 Colour in tiny squares on an A4 page or make a colour mark in your diary every day.